At The Norman Mailer Writers Colony, we did an exercise based on historical artifacts from the Provincetown Museum. Since the Mailer website isn’t posting them, here’s mine. I used a painting by Charles Hawthorne, The Crew of the Philomena Manta. Usually it hangs in the P-town Town Hall, but Town Hall is being renovated and so the painting is on display at the museum. This is an imagined day…. Charles Webster Hawthorne began a chilly day in 1915 by painting. It brought him to a place where he could not only see, but feel his subjects, which was the best and perhaps the worst thing about it. The Portuguese fishermen who were the heart of the painting titled The Crew of the Philomena Manta were tough, hard-working men and their lives were harsh. More than once, Charles felt himself taking on their burdens simply by studying their sunburned faces and the way they carried their bodies, exhausted after long hours hauling in the catch. He’d only been able to persuade one working fisherman to pose, the rest were townspeople. So before him stood the young man in his work clothes, patient from tedious hours at sea. Charles felt starts were the most important part and he wanted to fill in the details of the focal point before inviting the other models in to pose. He’d set up an easel at his studio above Days’ Lumberyard, built the year before in 1914. Only two years ago, he’d been made a full member of the French Société Nationale des Beaux-Arts and his career was thriving. His fees from teaching and brisk sales of his work easily covered the fifty dollar a year rental. He picked up the paintbrush and moved in front of the painting, looking forward to working with one of his favorite friends, color. As he told his students, “Painting is just getting one spot of color in relation to another spot…. Let color make form, do not make form and color it.” He remembered the first time he had a tube of oil in his hand, feeling the weight, then the gloop of rich ochre as it dropped onto his brand new palette, a globule of golden magic. The smell and feel suffused his memories. Oils opened up a new world of playing with saturation, hue, and brightness. They gave him a connection, however tenuous at the beginning, to the great painters of the past. As he worked, the sounds of the lumberyard and the smell of freshly cut wood faded in his awareness. Years of painting outdoors had taught him to work quickly and efficiently. He used oils thickly on his palette, less so on canvas; he had a sensual appreciation for the ‘fat’ oil right out of the tube. He mastered the basic ‘fat over lean’ technique to prevent cracking during his first years in New York. After spending the whole of 1898 in Holland, he adopted Franz Hals’ tonal sense, rich despite a simple palette of cadmium red medium, raw sienna deep, and ivory black. Even more intriguing had been Hals’ brushwork, a study in brevity and perfect for his style, particularly when Charles loosened up his technique in his landscape work. Charles had started teaching his students a more structured approach to Monet’s style of impressionism in order to differentiate between color and tone and also to successfully re-create the illusion of light. 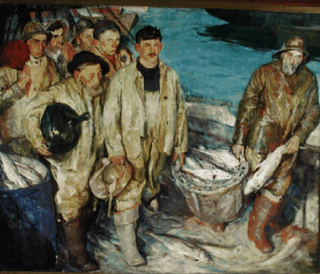 As he painted the fisherman, he thought about the young man’s life at sea. Charles’ father was a sea captain, though Charles hadn’t grown up at the ocean’s edge, but in Richmond, Maine, a town of just over twenty four hundred people on the banks of the Kennebec River. Charles felt at home with the sea captains and their crews in the busy fishing village of Provincetown after his travels to New York, Paris and Holland. It was a place that brought together elements of his past in a setting of spectacular light and landscape. In the wake of the fishing and whaling industry, the railroad brought in wealthy tourists, intellectuals and artists. He’d never been a New York insider and at age 43 he no longer speculated whether Robert Henri (“hen rye”) was the one who kept him out of The Eight, the 1908 landmark show at New York’s Macbeth Gallery that would have launched his career in dramatic fashion. As likely, it was Charles’ disinclination for self-promotion. Because he was reserved in these matters, he concluded his success would come outside of New York. He’d enjoyed his time as William Merritt Chase’s assistant before heading to Holland and he’d learned a lot from him. They’d shared a love of oils and Chase introduced him to plein air painting. He had a good life in Provincetown and emulating Chase’s teaching style had proven very successful. He did not inherit Chase’s mantle directly, nor was he as gregarious as his mentor, but starting The Cap Cod School of Art was the next best thing. And it had grown. There was a steady stream of artists and a thriving colony. He enjoyed his students and they showed an enthusiasm that he found gratifying. What he was teaching them as much as craft was a belief in art itself. If any of them arrived in Provincetown expecting a finishing school, they were quickly disabused of that notion. Charles had them go back to the fundamentals and insisted on respect for the working men and women in town. He was known as a painter’s painter. He adjusted the brush in his hand and touched it to a spot of cranberry color he’d mixed on his palette to achieve the ruddiness on the fisherman’s ears and nose. Charles had painted the imprimatura, the transparent color which would eventually allow light to reflect through the paint layers. He’d built up some color, but the young Portuguese fisherman remained unfinished. He stood as the central figure of the composition in his fishing clothes, felt lined rubber jacket and boots, with a flannel lined oilskin hat in one hand. His other hand would hold one side of a full bucket of fish when the painting was finished. He stood straight and there was something in his eyes that Charles recognized, a young man’s desire to see the world. He wondered as he worked on his features, how long his subject would stay in Provincetown. When they finally took a break, the young Portuguese looked relieved and Charles realized much more time had passed than he thought. He clapped the stoic young man on the shoulder and invited him to lunch. A briny gust greeted them as they stepped outside. The fisherman looked out to the horizon and saw his future, including his escape route. Charles looked out to the light he loved on the foamy whitecaps dancing across the cerulean blue of Providence Harbor.